The guests have gone, the family is in harmony, it is the hour of the dragon. What better way to celebrate our newly-regained freedom than with a tea that comes with so much good press that it's ghost-writing its own autobiography. 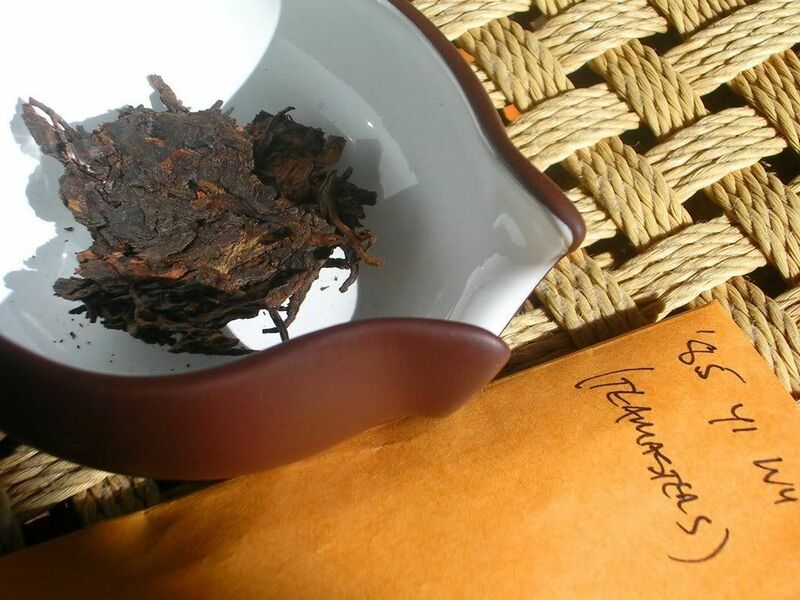 Courtesy of MA [copious thanks], this 250g tuocha is sold by Teamasters for $265. Remarkable, being some of the best leaves on an 80s tea that I've yet come across, in that they're not fragmented beyond belief. Luxurious, full leaves, easily separated from one another, which are dark and rich in colour. The aroma is very sweet, and very dense - yet remains crisp. There is a certain shicang [wet storehouse] about it which becomes much more obvious when the pretty little leaves are added to the damp pot. I do like shicang character. After just 4s, the soup is already pitch-black [pictured]. This is a rich, heavy little tea. The aroma is sweet wood, typical decent shicang. 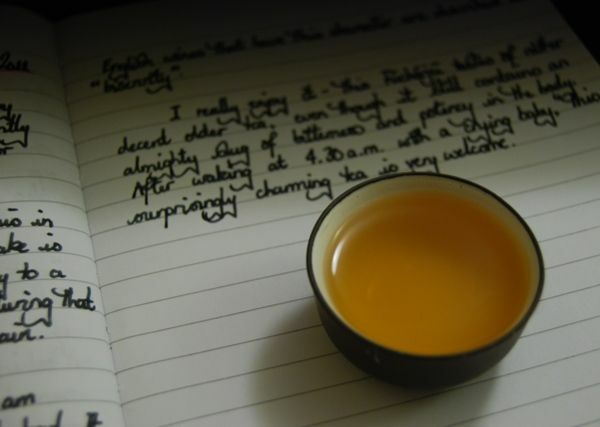 The texture of the liquid is thick and gloopy; it hugs the sides of the wenxiangbei. The flavour is interesting: it is very, very smooth, with a particulate (almost powdery) character that I have come to associate with shupu. Unlike shupu, however, this ends in a seriously triumphant huigan that sits in the throat and sings for a long, long time. It is a rapid, "impatient" tea, moving quickly from the initial malty woodiness to that mouth-watering and enduring finish. The ending in the throat, lapsing into engineering metaphor for a moment, has the self-sustaining and self-amplifying quality of a vibration occurring at the resonant frequency of the material. It builds and builds, and the mouth continues to water. Fine stuff. In the interests of balance - what didn't I enjoy about it? It doesn't change much over the entire session, and it isn't immensely complex: it is always instantaneous shicang rapidly falling into the vibrant huigan, which little else to experience except for the sweet, damp aroma filling the nose. Hardened from age, but black and whole. It is quite heavy on the stems, which isn't obvious from the dry tuocha. "Nice to visit, but I wouldn't want to live there." It has definitely left "middle age", but hasn't quite entered "old" yet, being zesty and tangy whilst managing some darkness and depth. I like it, but I did get a little tired of drinking 54 cups of the same, constant brew. One of the realisations that has come from a busy period hosting an academic visitor is that nefarious nature of "tea spirit". Lei and I often discuss this obscure notion: that some people make naturally pleasant tea-company, and that others, while perhaps being good company, are not necessarily good tea company. So what makes the difference? My search initially took me to London. The combined effect of squeezing a visa out of the Chinese Embassy and the potent pollution levels made for a tiring and painful experience. However, it gave me a rare opportunity to see how the "Tea Smith" teahouse is getting on, which I encountered before, in April. Its proprietor knows a great deal about tea, of course. Ordinarily, this can be quite an obstacle to being good tea company - the desire to impress knowledge on someone else seems to get in the way. I remember Phyll writing something similar about a recent tea-tasting event in the US. However, in a man of quiet modesty such as the owner of Tea Smith, this knowledge, appropriately delivered, can be conducive to a good tea atmosphere. With aching head and sore throat, I slumped over my diary and a copy of Records of a Travel-Worn Satchel and let the calm of Tea Smith bring me back to myself. Exhibiting the consummate skills usually found in legendary bar-keepers, the staff of Tea Smith ensured my good mood was eked out of me like the slow flavour from a tough tea-leaf. I remembered Phyll's other comments, about his brewing of a 1950s pu'er at the tea-tasting event: because of the busyness, he reportedly found the experience of drinking the famous tea surprisingly unimpressive. Being a modest type, he put this down to faults in his brewing - however, having experienced the same thing several times in the company of all manner of accomplished brewers, I put this down instead to the nature of the company itself (or rather, the nature of the interaction between the people present). Many times have Lei and I sat down to tea with various guests and simply found it very hard to enjoy our favourite teas. Something just... isn't right with some tea-company. Now, surely, this is no flaw in the natures of the people themselves, but merely an unexpected result of putting people of different dispositions at the same tea-table. As our academic visitor joined us for tea most nights (being Chinese, he was particularly keen to do so), these thoughts revisited me. What made Tea Smith such good tea-company, and what made our visitor (and other well-meaning souls like him) less good tea-company? Sitting in Tea Smith, listening to a pair of web-writers interviewing the owner, the four tea-concepts of Rikyu came back to me from a recent book of Lei's that I had strayed across. I realised, recovering at the bar, that these four concepts adequately define that which I previously held to be undefinable: what makes good tea-company? The four words are easy to read, and there are a hundred vague explanations in a hundred vague books, and I appreciate how easy it is to dismiss them, and the bad poetry that accompanies them. However, the significance of the four simple words really made themselves apparent when I directly applied them to the practical task of defining good tea company. I am conscious that this subject could easily border on the preachy, or the distastefully faux-poetic, and so I'll try my hardest to make it as concrete and practical an interpretation as my limited skills will allow. Wa: without harmony of spirit, there is violence on some level. Many times have I sat to tea with people that have different expectations, different characters, that have led the tea session to be instantly disappointing. The tea becomes characterless, hard to concentrate upon, and instead the hosting instincts are at work trying to manage a lack of harmony between characters. This hard work ensures that the tea session has instantly failed, often before it has even begun. Rikyu stated that there is no place for the fuss of manners and the endless wheels of etiquette at the tea-table, which should instead be a place of sincerity and simplicity. Lack of harmony between characters, even well-meaning characters, is bad tea-company. I see this when sitting down to tea with people I don't know very well - the lack of wa soon becomes obvious. Kei: respect is harder to achieve, even if the characters are harmonious. It indicates gratitude: not necessarily gratitude to the host, but that gratitude that Suzuki calls (bear with me here) the sheer gratitude of living - the understanding that what is important here is not, for once, "me". It is the ability to put personal considerations out of the way, and simply enjoy a simple tea-experience in a simple way. To put something else ahead of oneself is kei, and it can be very hard for some people. Many of my friends from London are like this, maybe due to the dog-eat-dog nature of life in the capital (and I'm no saint in this regard, indeed in any of the four regards). Sei: purity is simplicity, getting rid of the unnecessary. Drinking tea is not complex, and to make it so can create bad tea-company. Though gongfucha can involve several implements, if any of these feels redundant and is used only for show, there is no sei. For some, this could mean no wenxiangbei, perhaps, but I believe that it mainly involves avoiding the desire to flourish, and to show off. It is simplicity of spirit that is at stake here, and without it we have the flourishing, "impressive" gongfucha of the tourist districts. In guests, that same simplicity of spirit means the avoidance of showiness of knowledge. This is where Tea Smith scores highly, and where several other knowledgeable tea-friends (including myself) have something to learn. Jaku: so hard and fast is recent life, even in the relatively slow "backwater" of academic existence in comparison to modern financiers and industrialists, that tranquility is something so often desired and so rarely achieved. Our recent academic visitor had no jaku: for him, sitting at the tea table was merely a continuance of normal life, networking, discussion. Ordinarily, these are beneficial - but not at tea. The ability to let go that which truly does not matter determines the quality of tea-company. So many tea sessions have Lei and I had, with so many people, and sitting in Tea Smith, I realised that it was only those in which wa, kei, sei, and jaku were present could I count as being good tea-company. They made for a good metric by which to explain my dissatisfaction at previous experiences, and also to give me pointers about how to improve myself in future. Good tea-company is a rare thing to be cherished, I've learned. Its rarity says much about how modern people relate (or rather, don't relate) to one another. I sometimes take a chance on a tea if it is recommended by people I trust, and this one was recommended by two such trustworthy souls, making it an easy purchase [many thanks to Dr. Mike/Psychopuncture and Geraldo]. 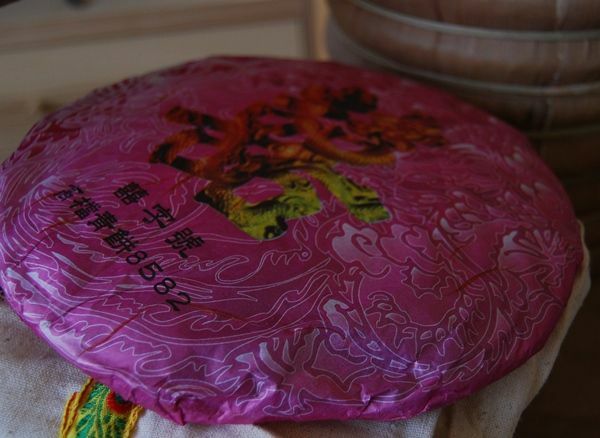 A relatively good price for a five-year-old cake, this sells for $42 at Yunnan Sourcing. Note that the web-site has the factory name as "Fochaji" and the mountain as "Ailuoshan". The factory is a Taiwanese venture, the owner of which buys leaves from the three Jingmai, Ailao, and Wuliang mountains. The name of the company translates literally as "Not tea-house" (a Zen refutation?). Ailaoshan is "Mournful Prison Mountain" - very melancholic. The cake was photographed at dawn, and so the light plays tricks with the colours: it is a darkish brown in nature, rather than the orange that the sunrise would have you believe from the camera. The bing is homogenous across both faces, and throughout the cake, being made of small spring leaves that look fairly fragmented. A few tips are scattered throughout, perhaps more for aesthetic appeal. The leaves are somewhat darkened - either by age or processing. Let's hope for the former. A pleasant yellow soup confirms that this is a slightly aged cake, rather than a processed cake, which is a good first impression. 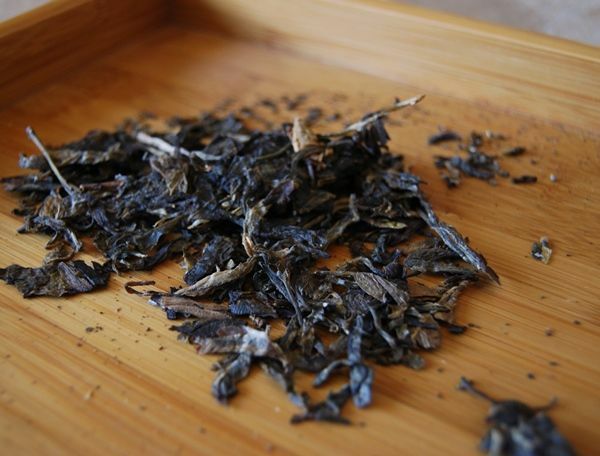 The wenxiangbei holds a progression of darkly sweet, rich scents, which are found in the nose after the the swallow. The flavour is tart, brisk, and, thankfully, very honest. A straight, unwavering ku runs throughout, becoming a good huigan of straw and grain. The flavours are not as rich as I would like, but this isn't a very expensive cake. What there is on offer are plenty of sweet, grain-like notes, though it does open quite thinly. We found that concentrating on keeping the pot hot (encouraged by boiling water on its outer skin during infusion) drew the best flavours out of the leaves. The ku settles down by the sixth or seventh infusions, revealing a pleasing set of gently decent mushroom flavours to go along with the grain-like character. The soup remains a solid yellow until the end of the session - always a good sign. Spring leaves, with some whole, mixed with around 50% filler of a mulch-like nature. Not too many tips. The leaves are mostly green, but some of the larger ones are damaged around the edges, which have oxidised bright red - this seems like lack of care when handling the maocha, rather than a deliberate processing step, as the result is not noticeable in the flavour or aroma. A decent, inexpensive five-year-old cake. Not wonderous, but for the money it certainly performs well. Perhaps near the top of the "second division", this cake is honest, and does not make claims to being in the "first division". The sincere, straight ku might give this the legs to age well, and it has some fairly robust flavours hiding underneath it. I made a note to myself deciding not to buy any more of this - there are other more interesting fish in the sea, I think. Upon revisiting, this tea seems distinctly underpowered - the cup feels fairly "empty", in that there's not a lot of flavour in it. The brew is dominated by an unusually tart bitterness, with very little underlying flavour. I hate to say it, but this does taste like a cheap tea, on revisiting: it seems slight, wan, thin. I have a single cake of this, and look forward to seeing how a bitter-but-thin tea ages. I had hints of mushroom and a touch of sourness, in this session, but little else discernible under that strong bitter note. I bought this cake in 2007 for $42, and it was cheap-but-cheerful. I recall trying it again a year later, and being dismayed that it had "gone quiet". Happily, progress has been made and this tea is now aging nicely. this is hugely encouraging. Fuchaju ["not teahouse"] is owned by Huang Chuanfeng, who, Babelcarp informs me, is a Taiwanese teachap (I recoil at the phrase "tea master") with a degree of fame in the area of slow roasting. He has migrated this technique from wulong, where it belongs, to pu'ercha, where I cannot imagine what horrors it could inflict upon the leaves. 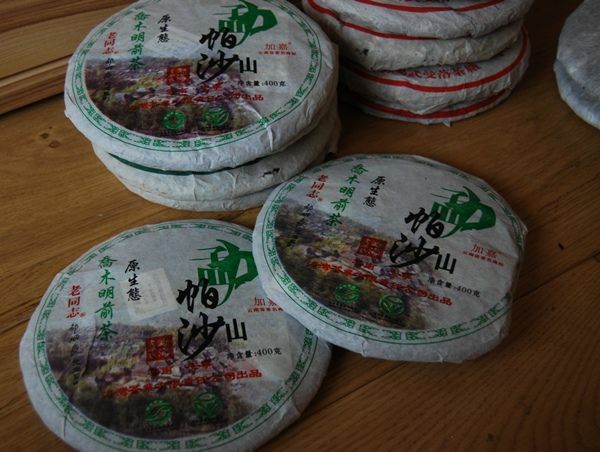 Ailaoshan is in Simao prefecture, which was the source of a decent cake from Yunnan Sourcing this year. 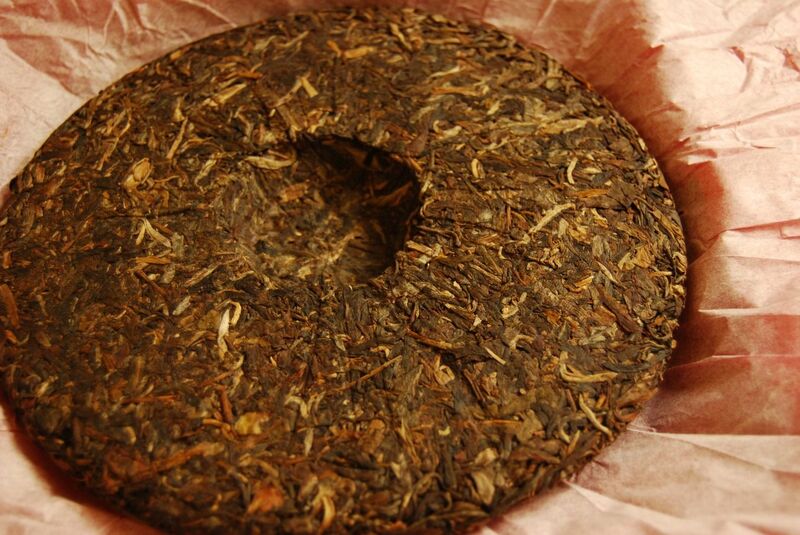 The fat cake, shown above, is not immensely aromatic, but it has darkened noticeably to become a red-brown colour. 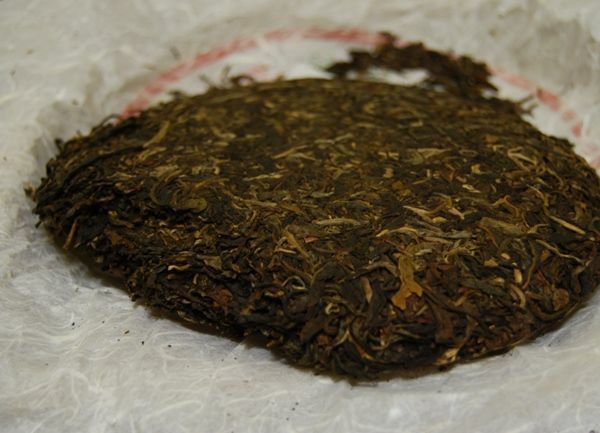 In the 2008 session, the tea had plenty of bitterness, and that seems to have lived on, because even the rinse smells potent. The soup of the first infusion is now a yellow-orange colour. I am excited to conclude that this tea is now not at all bad. There is a surprising amount of content in the cup, and the tang of it dwells forever in the mouth, hanging splendidly in the back of the throat. Perhaps all of that original bitterness and potency has indeed transformed into something of value. The Simao character is obvious: it is sweet, granary, and husky, in a savoury way. Some English wines (stifle your laughter) that share this characteristic are described as "biscuity". It is a distinct enjoyment: the cake now tastes of a decent older tea, even though it retains an almighty slug of bitterness and potency in the body. After waking at 4.30 a.m. with a crying baby, this surprisingly charming tea is very welcome. I should also note that this cake does not taste nine years old. The wrapper has a more credible birthyear of 2005, which would seem more in keeping with what is in the leaves at the moment. I don't want to "jinx" things, but English storage seems to be rather beneficial, if the results of recent re-tastes are anything to go by. 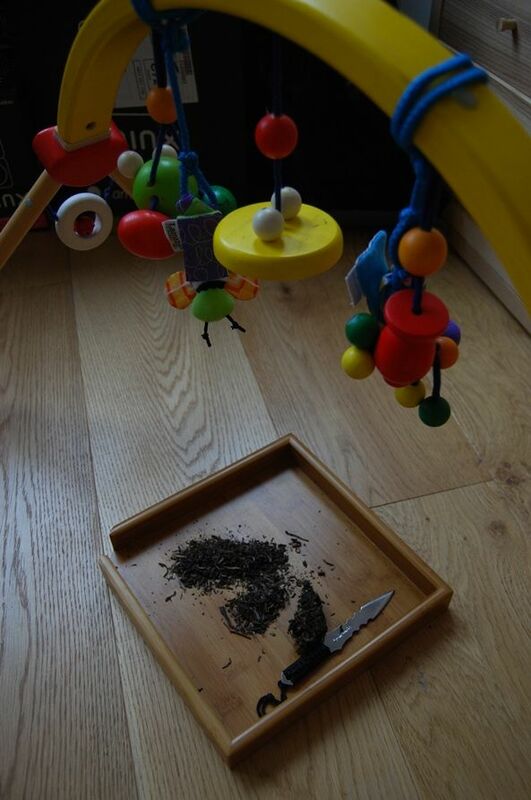 To the tea-tasters of the forthcoming tasting event, Gordon of Dragon Tea House has indicated that the samples are away, and winging their way to you. I am informed that these should arrive within three weeks, so don't be too concerned if they are not with you immediately. 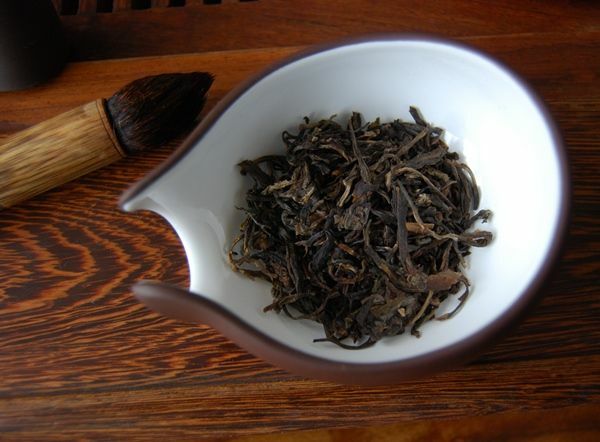 The results of a little experiment with a 2005 Dahongpao from Houde are shown above, in which we tried following MarshalN's suggestion of using copious quantities (3/4 pot) of leaf. We don't keep a lot of yancha in the house, but this small experiment yielded particularly pleasant results: what we both assumed would be a revoltingly bitter soup turned out to be deep, rich, and filled with nuances that had passed us by in the first tasting. I previously noted a green harshness in the finish of this tea that appeared during later infusions, but even this was removed by the "overbrewing" method. Jolly good results made this a brewing method that we shall likely continue to employ. Do give it a go yourself, and see if your favourite yancha doesn't come out that little bit richer. Many thanks to JMcM for the shupu brick, from the Yunnan Import/Export Co., which forms the subject of these additional notes. Malty and refreshing - this brick has a certain zestiness in its character that hints at a certain youth about it. Lei and I sat down with this for a warming session, wearing thick clothes and with the heating on - despite the fact that it is, nominally, summertime. Given that we had our first barbecue in the sweltering heat of March this year, one might be forgiven for thinking that the seasons have somewhat lost their way. The brew, while thick and dark, does not overbrew, but retains a stable character until the end of the session. Tiny and fragmented, but from a small grade, with a number of tips inside - better than the usual shupu grade. A welcome, warming tipple on a cold evening. Thanks again to John for the kind gift. If yesterday's morning tea was a somewhat ungainly bruiser of a leaf, this morning's is a little more dignified - if unusual. At the very bottom of the wodui [moisten pile] fermentation heap used to "cook" shupu, the high pressure and high heat give rise not quite so much to diamonds, as to tough little nuggets. These charming little lumps are exceedingly inexpensive ($28/Kg from Tuochatea, for example) and make for a somewhat unusual experience. Many thanks to the infinite splendours of the Davelcorp Foundation Shichangpu Associates Inc. for its most munificent blessings in providing these samples. The tou in "chatou" means "little piece", and is also the word for "head". I was long familiar with the term kowtow, for example, referring to the famous Oriental prostration, without knowing that it was Chinese, with the latter syllable being tou in modern Pinyin. It just goes to show what you don't know you know. Small rounded nuggets, these charming little items are a dusty brown, and smell of the somewhat salty fresh-shupu aroma. Deep burgundy soup gives the immediate impression that I have overbrewed. CB's description of overbrewed young shupu as "burning tyres" springs to mind. Alas, no tyre! Merely the rich scent of currants and sultanas, with some maltiness, and a touch of saltiness. Though the colour is strong, and the character is rich, this tea is confoundingly mellow: it is "worn out" in the most lovely way, like a faded painting. Saltiness fades after an infusion or two, transmuting into an enjoyable creaminess. What a curiousity is this eroded leaf! It remains stable and enjoyable right until the end, without any sign of cracking apart as poor shupu is wont to do. Small shreds of black leaves, there is little to be seen. What an experience: it has the potent power of young leaf, evinced in its caffeine content, and rich aroma, and yet the flavour is so well-eroded and muted (presumably by the intensity of its "cooking"). It is rather wabi-sabi, in that it contains a beautiful simplicity with a humble, worn, threadbare character. I cannot see myself ever getting through an entire kilogram of this tea, but it does make for a fascinating experience. It is warming (medicinally speaking) and enjoyable, if steady and uncomplicated. One for the shupu-tolerant, of course - but worth trying a little taste, if only for your own palate's sake. 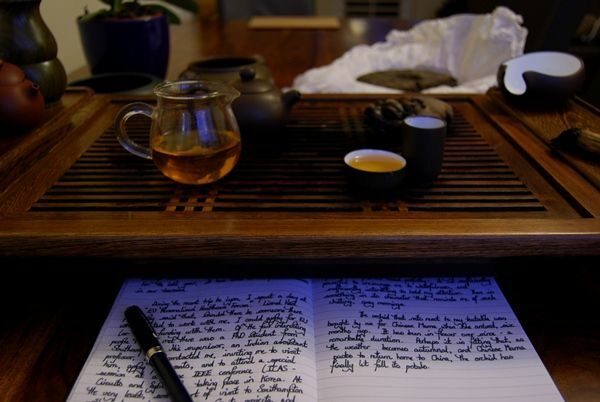 You can read Geraldo's ever-excellent notes on this same tea (in comparison with a Menghai chatuo) within the leather-bound comfort of Chadao. The life of uncivilised man is "nasty, brutish, and short" according to (Thomas) Hobbes. This famous quote from Leviathan sprang to mind as I entered into man-versus-leaf combat with this Dehong-area bing. Of unknown factory, this is an intriguingly brutal cake supplied by the generous auspices of Tea Logic's VL. Very high compression and highly chopped, dark leaves make this cake look very old-fashioned. I give up my usual technique of trying to separate the leaves, and just drop a few chunks into the pot with a loud "thunk". It's like brewing dice. The first few infusions are predictably quite quiet, given that we are merely passing water over the outside of a few chunks of very densely-compacted tea. What flavours are apparent are surprisingly pleasant: rich, deep mushroom, and a similarly surprising smoothness that coats the mouth. So as the leaves separate from their chunks, whence commeth the almighty agony. VL noted when he provided the tea that "the Dehong is quite strong, so be careful". As the first infusions passed, I thought, "Ha! Vlad is getting soft in his old age!" After the fifth infusion, through watering eyes, I could almost hear his quiet laughter in the distance. The brutality in this tea is not at all in its ku: it isn't like a (new) Banzhang, where the power is in the bitterness. Here, the agony is from sheer, unadulterated caffeine. Five infusions of this monster and I felt as if I had been downing doppio espresso all morning. It's the first time that I have ever had to stop drinking just because of caffeine, considering myself fairly well-accustomed to it by now. This is the tea equivalent of a faal curry. Apparently, VL's father drinks this for fun. Consequently, I now harbour a quiet respect for this unseen (presumably rock-hard) patriarch. Tiny little chopped, dark fragments. Inscrutable. This tea didn't just pummel me into submission - after the pummeling, it tied me to the back of its chariot and dragged me several circuits around the walls of Troy. I'm drinking it in my office, as I write this, and my head is reeling in Dehong-induced agony. Never have I been so able to believe the claim to "yesheng" [wild]. Overwhelming. This article has a two-fold purpose: the first is to explore a recommended tea, and the second is to further examine the effect of different waters on the resultant infusion. Alternatively known as Pashashan, this mountain is in the south Menghai region. The tea was recommended back in the later Georgian era by Bearsbearsbears, and also by Scott of Yunnan Sourcing from whence comes this bing. I've mentioned before that a recommendation from someone whose opinion I trust can be enough to get me to buy a cake without first trying it (particularly if it's not too expensive), and this is definitely one of those cases. It's been on my list of recommendations for about a year, and so it's good to finally sit down with it. It was around $32, making it not-quite-expensive, but also not-quite-inexpensive. Mengpashashan itself was, according to the neipiao, settled around 300 years ago when it was covered in wild tea trees. There are now over 1000 acres under cultivation, with a mean elevation of some 1700m (maximum ~1850m). The neipiao also claims that it was migrants from Mengpashanshan who first settled the Banzhang slope on Bulangshan, about 130 years ago. The ticket claims that the constantly misty, rainy atmosphere of Mengpashashan results in early budding and long harvesting periods, with sizable silver tips - these are evident in the cake itself, so perhaps there is something in it. The wrapper, neipiao, and neifei are all very modern in printing and materials, and look rather professional - clearly this tea is aimed at the type of folks in the "organic" market, rather than the somewhat more rustic tradition of Pu'er (and I do like rustic very much). Since moving house a few weeks ago, we've been brewing tea using our Brita-filtered water from the mains supply - Thames Valley water (our regional water-board) is notoriously poor in quality. Today marks the first time that we've ventured out to secure proper water: we're trying out "Scottish Mountain" mineral water from a nearby supermarket. The mineral composition is low in both calcium and carbonates (chalk), which makes a nice change to the water that comes out of the Brita filter. During infusion, we'll switch between the waters to examine the effect. Whole leaves makes this cake look very un-Taiwanese, thankfully. It feels as if it has a "skin" of chunkier leaves around the faces of the cake, with some slightly lower-grade material on the inside. The tips are big 3-4cm affairs, backing up the claim made by the neipiao. Apart from the pleasant appearance, one striking feature of this tea is the aroma, which is highly potent and jumps right out of the chahe. On adding the leaves to the damp, rinsed pot, the sweet aroma intensifies even further - quite remarkably so. Good aroma can imply good flavour, and so the first impressions are favourable. The colour is an absurdly bright yellow - it almost appears luminescent. The clarity is likewise extreme, being entirely crisp and clear. The few furs from the tips float around in the bottom like distant fish in a pool of pure spring water. The beidixiang is fresh and green, of good duration, while the lengxiang is darkly sweet and similarly enduring. The long-lasting nature of the aroma similarly bodes well for its character. What a fresh and zesty affair this tea is, carrying with it a good, solid, untreated ku. It palpably swells as it progresses to the back of the mouth, resulting in a huigan that makes my jaw muscles ache in a pleasant way. The texture is smooth, from the tips. My mouth remains watering from the huigan over one minute later - good stuff. Now, with the basic character of the tea ascertained, we switch from the mineral water to the Brita-filtered water. The effect is dramatic: the previously-enduring aroma are short-lived, and unremarkable. They are muted and do not thrill the nose as before. The texture in the mouth remains as smooth as before, but the sensation does not reach up to the nose as it did previously, nor does it stretch out in flavour to fill the mouth as much. Also, there is very little of that swelling crescendo towards the huigan. Resumption of mineral water in the next infusion returns the tea to its prior pleasant state. The effect is enough to convince me that putting in the little extra effort (and expenditure) to obtain this mineral water is well worth it. Even out to the tenth infusion, the mouth remains watering, and the soup remains bright, clear, and very yellow. Whole, or very large fragments, containing a variety of leaf sizes. The leaves are of peculiarly healthy nature, reminding me of a good maocha: the stems are rubbery, thick, and flexible, while the faces of the leaves are robust, pliable, and strong without being tough. I cannot say if this is because of their "organic" status, but they're certainly very good to handle. Really rather pleasant. I think this has the bright ku and wide flavour to make it appear quite decent in a few years time. This tea is a particularly dangerous recommendation for me, because it appeals to my personal preferences very much: it is a yellow, mushroom Pu'er, and quite strong - just the way I really like them. I can see myself grabbing a few more of these to see what happens over the years, but do take that recommendation with a pinch of salt: this is a borderline recommendation based only on my preference, and you may well find yourself not too enamored of it. Personal experience, as ever, is the best judge. It's one to try if you haven't, though - judgements on price being something that each of us has to do alone, of course. In recent memory, it's not up to the 2007 Xizihao 8582, but it's good enough. I was very happy with this pile of cakes, which I bought at the time of release for some $31. They're now selling for $40 - not much of an increment, considering that they are now half a decade old. In fact, $40 for a decent five-year cake could be a real bargain. It's time to revisit this old cake to see how it's doing - and whether or not I should be buying more. Over the years, this cake has turned from its original black to a proper red. The photograph below doesn't appear to show this change very well, but, in natural light, it's a red 'un. This fills me with hope. My cakes seem to follow seasonal trends, and they get a little quiet and introverted during their winter slumber. The aroma in the tea-room is sweet, but markedly quieter than in summer, when it really strikes the senses. The leaves are mostly small, and quite fragmented. It is easy to separate a session's worth of leaves from the mothercake. At this stage, I'm rather nervous - will I still like this cake? Was I able to pick a decent cake back when I bought this? What if it's dreadful? I let out a much-deserved sigh of relief as the full sweetness of the aroma arises from the first infusion. At the very least, it's not a dead cake. The hot water wakes it from its rest. It is very sweet, but this swells to a mouth-watering finish. 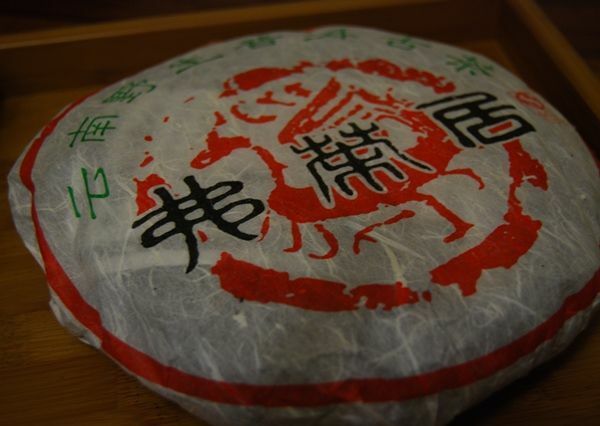 Like the 2009 Xizihao cake from the same area, it is remarkably powerful. There are notes of tobacco and hay, in that savoury manner of the Xizihao, but both are dominated by a huge, clean kuwei. It cools the mouth nicely - this suggests the presence of some decent leaves. You'll notice from the above image that the soup has darkened in the years since I last photographed it. The big question that I ask of myself is: should I buy more? It is clean, and powerful, and sweet... but it's not immensely dense in the mouth. It isn't a big, fat, thick tea. Rather, it is a particularly well-blended and clean example of what Haiwan can do. At no stage does it turn rough, which is a pleasant surprise from this more mainstream producer. Note that it's not their usual (fairly bad) "Laotongzhi" [laow-tong-djer, old comrade] brand, which might explain it. As I mulled it over, I realised less than $40 in Maliandao will get you something awesome from 2005 (e.g., Yisheng), which makes this Haiwan cake seem less appealing. Compared to a lot of cakes, though, it's a goodly amount of Mengpasha potency for a decent price. The second of two dancong generously provided by Ian [thanks again! 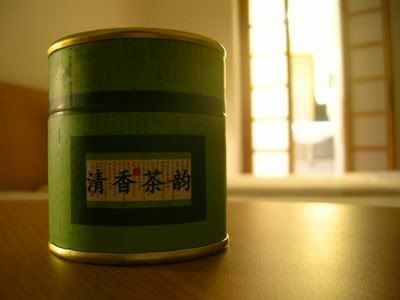 ], this tea is sold by Jing Teashop at a touch more expensive price ($27/100g) than the previously-enjoyed 2007 Baxian. I always previously considered dancong to be on the very outskirts of "good tea", being a mere fruity diversion, but I realise through exposure to some sincerely decent dancong lately that this was a very grave error due only to my ignorance. 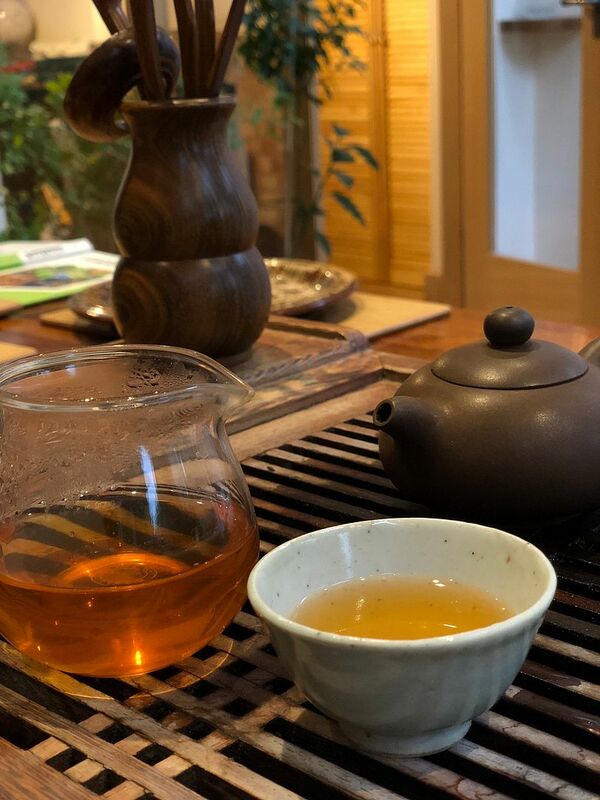 In fact, I've come to enjoy it as much as most other types of wulong (though surely nothing can reach my personal preference for Tieguanyin or Taiwanese gaoshan leaves). Shorter and darker than the 2007 Baxian, these are more conventional dancong: chocolate coloured, and looking rather like yancha. One or two of the dark twists have green ends remaining from the roasting process. A very clear yellow soup that looks rather like a good malt whisky. Magdalen Tower shatters the morning peace with its six o'clock chimes. The beidixiang is rich honey, which also characterises the flavour: darker and sweeter than the Baxian, perhaps fitting given its milanxiang genre [honey-orchid scent]. "Beautiful tea." The body is so floral that it reminds me of Lei's infusions of actual flowers: buds of rose, chrysanthemum, and others. A nice touch to the presentation of this tea is a note of sourness in the finish, which gives a gentle huigan. The endurance is fine, marching on well through seven infusions, which is a good indicator of quality that is impossible to fake: if the leaf (particularly a wulong) is still delivering good character after so long, it must be decent. Jing claims that good dancong does not fully unravel in the pot. Duly, this tea does not unravel, but that seems to be more to do with the fact that the leaves are so very, very thin - attempting to unfurl them causes them to rip apart so easily. Jing's criterion could well be true, but this leaf is a touch weak in physical structure. Only the very leaf-edges are oxidised, and the amount of redness is constrained to a very thin, precise border, indicating a good degree of control in the processing. 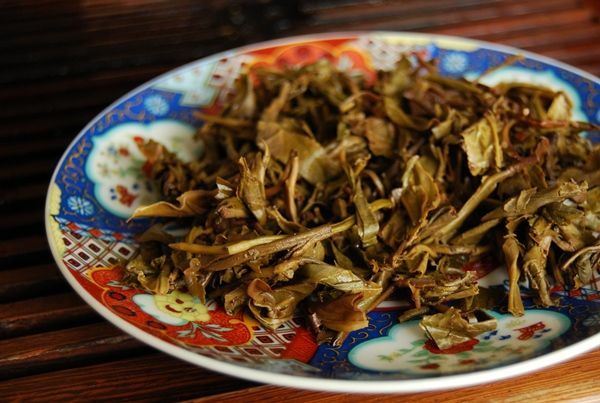 The amount of green basis leaf is high, and this corresponds to a fine, buttery gaoshan wulong character in the nose. A fine leaf, clearly, if the lesser of the pair provided by Ian - even if it does cost a few dollars more from the vendor. At the price, it's still a great buy. 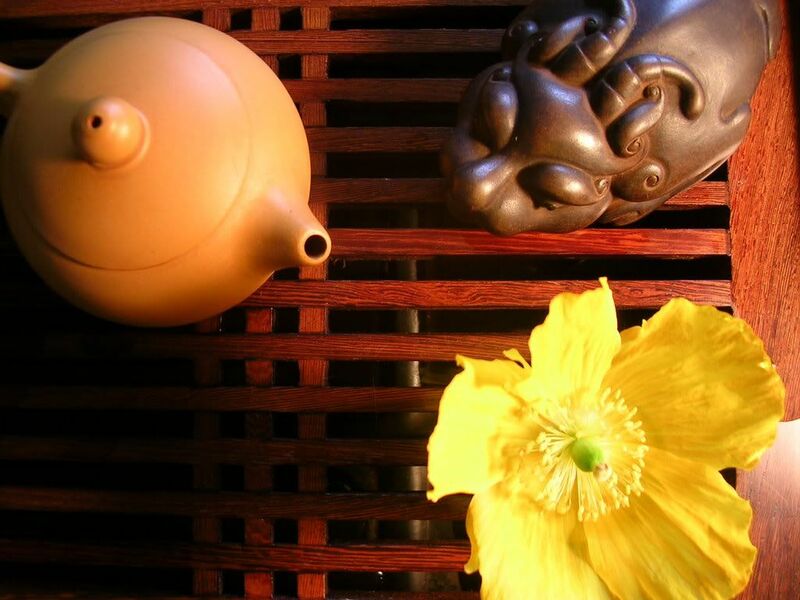 Kindly supported by Gordon at the Dragon Tea House, I'm happy to announce another tasting event for the tea-community. 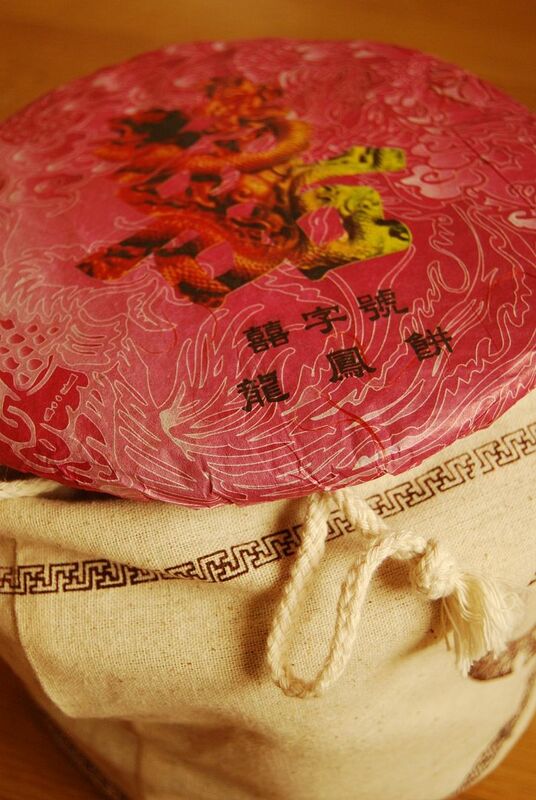 You will receive three samples of 2006-7 shengpu bingcha, labelled red, green, and blue. Spend some time with them, and post your thoughts and notes. I shall draw together a summary of all notes at the end, and reveal the names of the cakes. Your one clue is that the three cakes are from three well-known factories! i. Samples for this event will be sent out soon. 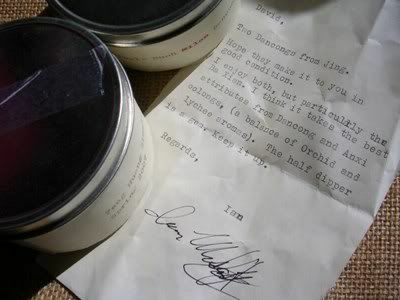 Please only commit to joining if you are able to taste and review the three samples within two weeks of receiving them. ii. Please e-mail your notes to me, so that I can draw the opinions together and form a summary. You're free to post tasting on your own web-sites, whenever you wish. iii. As ever, the goal of the event is to share a tasting experience, learn from one another's approaches and observations, and generally to have a good time with some new teas. There's no pressure to correctly determine the identities of the cakes, but do have a guess if you wish - there's nothing to lose in a missed guess! iv. Please contact hobbesoxon AT googlemail DOT com if you would like to take part. 15 places are available. Extra names will be added to the reserve list in case a spot becomes free later. Many thanks to all the respondents - the slots for the event are now full, with the remainder added to the reserve list in case a position becomes free. As ever, neither Hobbes nor the Half-Dipper has any connection with the sponsors; this event is arranged pro bono publico. Samples will be sent directly from Dragon Tea House. There is no charge for this event. Having recently received two e-mails on the subject of the Mandarin Chinese terms used in the Half-Dipper, I thought that I might perhaps briefly touch on the subject publically. The Chinese terminology can look daunting. 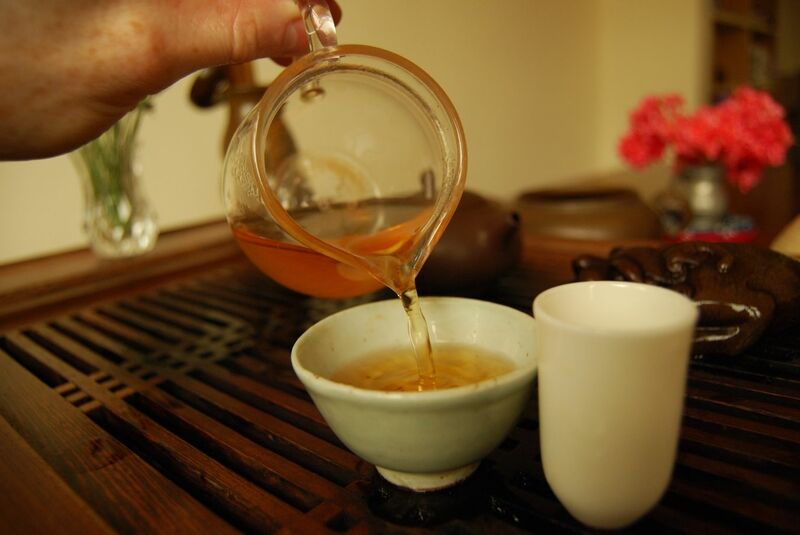 The thing is, it is very convenient to describe tea - using just one word rather than a whole phrase, such as yunxiang instead of "the aroma that appears in the nose once the tea has been swallowed". 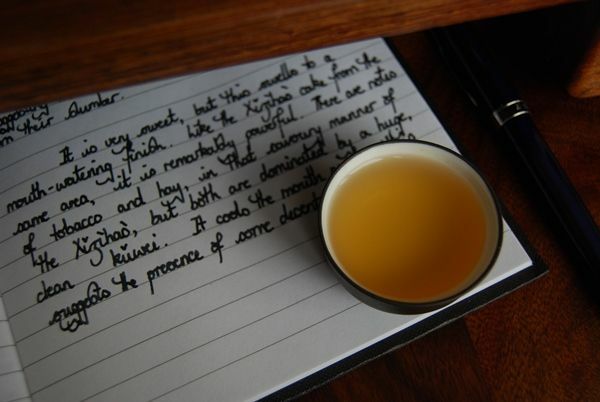 It's a lazy shorthand, but really compresses the tea notes and conveys the meaning in a concise way. I suppose that's the classical definition of "jargon". A short glossary would be useful - and I have considered adding one a few times - but figured that it would be redundant, given the ever-excellent Babelcarp, created by Mr. Perin. To that end, I've placed a permanent link in the left column for future newcomers to the Half-Dipper. I tend to not use terms unless they appear in this database, because that's pretty much the "standard reference" for tea-terms in English. However, I should add a few words on "ku", as I notice it's not in Babelcarp, and is a word I use a great deal. I use it to mean the pleasant (or, at least, potentially pleasant) kind of bitterness that is associated with young shengpu - as distinct from "astringency", the other type of bitterness that tastes exceedingly sharp and unpleasant, usually present near the back of the tongue. I have heard rumour that the Chinese differentiate between several other types of bitterness, but these two seem to describe most teas I've encountered. It is said that a good candidate shengpu for aging is one that, as well has having rich, full flavour, has a strong ku. 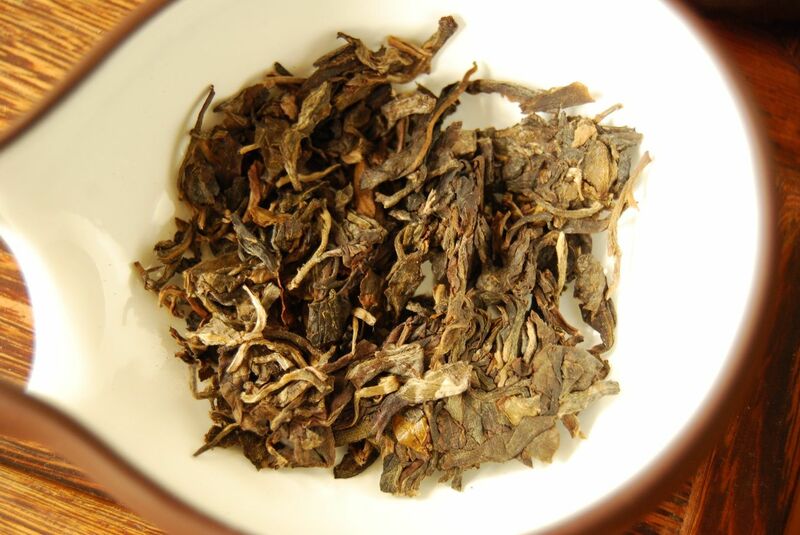 It is this potent bitterness that is, so they say, transformed during the slow shengpu aging process into the more rich, classical flavours associated with truly old tea. I add the caveats because I haven't been interested in pu'er for the decades required to learn these effects of aging first-hand, of course, having merely sampled different cakes of different ages. I can, at best, rely on the opinions (often translated from Chinese) of those with more years experience with observing the aging process. So, then, that will hopefully do it for the glossary. Thanks to JW and AB for the initial e-mails and questions. I'm out of town for a few days, having caught a train from Oxford to somewhere in Germany, going via the large tunnel under the sea that now connects Great Britain with France. As the large "Eurostar" train wended its way through the northern European countryside, I enjoyed a fine cup of tieguanyin, kindly supplied by John. Picked in Anxi, bought by John in Guangdong, taken back to the USA, posted from California to Oxford, and finally taken on a train across Europe, this is a well-travelled tea, to say the least. It gave me pause for thought about the really rather unique nature of tea-friendships. Now in a random German hotel, the little qingxiang green pot in which I placed the tieguanyin accompanies me as the sun sets. After spending a week-end camping (teabags, camping stove), it's great to be back drinking proper tea in a proper manner. Tea consumption while camping was limited to an essential breakfast cup, with little attention paid to it. By way of stark contrast, this morning's cup as the sun turned the dawn sky into a dramatic peach-colour was a welcome return. The final of the three less expensive Xizihao cakes for this year, the 7542 of course denotes the 1975 recipe from Menghai Factory (where the processor, Ms. Dong of Guoyan Factory worked as a blender). Dark and fairly large, these look fairly decent leaves. There exists a corresponding dark, sweet aroma about them. There are several thin, weak "yellow leaves" that I remove prior to brewing [pictured atop the pile in the chahe]. 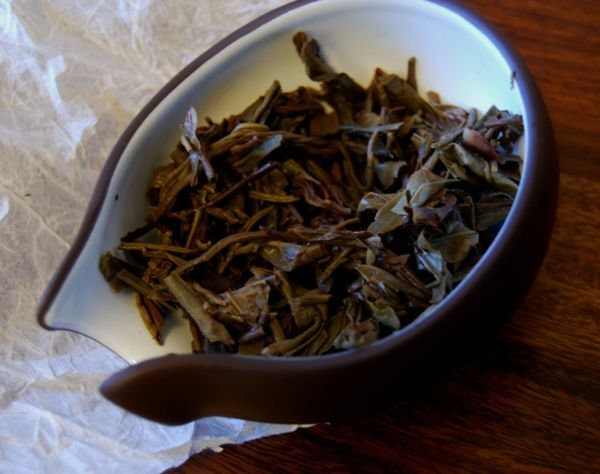 The rinse of the leaves is unusually frothy, given the cleanliness of the other 2007 Xizihao varieties. A deep yellow soup that later tends towards orange. The first infusion is fairly smokey, which vanishes for the remainder of the session. The flavour is light, quite thin, being merely "grain-like". The most notable aspect of this tea is its almost effervescent quality on the tongue. Even from the first two tiny pinmingbei, I feel the familiar, cold throb of sheer caffeine sitting behind my eyes, like a cheap coffee. I do rather enjoy the thin, grain flavour which has a quality presentation, yet lacks the depth and richness of the Huangshanlin or the 8582. By the third infusion, this tea is already on its way out, where the aroma is reduced to nothing. The fourth infusion sees the soup beginning to fade in its intensity of colour. The fifth infusion sees the flavour reduced to mere generic sweetness. The collapse is not elegant, whereas the other 2007 Xizihao have receded gracefully over time. A few tips, some fragments of larger leaves, but mostly just plain mulch. Though the "grade" of this recipe (grade 4) is allegedly "better" than the grade used for the 8582 (grade 8), they don't look too great to me. Surely, the notion of pu'er grades is a touch specious anyway. 2007 Xizihao 7542: just say no. I started the session thinking that I might get one cake for amusement's sake, but ended up deciding against even that. It's below-average at best, being far too uninteresting and so rapidly falling apart as it does. The strong energy is its major advantage (though no interesting chaqi was discernable). The two expensive cakes, Yuanshilin and Huangshanlin, were discernably created from higher-quality leaves, and are (to my mind) the "real Xizihao". The former was disappointingly processed (dark fruits, with ku removed to make it appealing), the latter was more satisfying (robust, rich). We will buy two cakes of the latter, though its "incomplete" nature (being mainly high and grain-like) stops me from wanting too much of it. The three less-expensive cakes were a marked step-down in the quality of the leaf, as is expected, and these are very definitely lesser teas. It is classic brand-based marketing to sell an "entry level" variety carrying the expensive brand marking (c.f., designer-label T-shirts, shopping bags, etc.) The overall impression of fragmented leaf mulch contrasts sharply with the luscious whole-leaf excesses of the expensive pair. Of these three, the 8582 was robust and pleasant. The Longfeng [Dragon Phoenix] was pleasant enough, but getting towards average, while the 7542 was very definitely below average in most regards. I expect to get two cakes of Longfeng and perhaps up to a tong of the 8582. Overall: they were good, but not excellent. Weighing their merits against the price, there are several other cakes that deliver similar pleasures which do not carry the brand-based price tag. This is my definition of "over-priced": you can get better quality for the same money, or the same quality, for less money. These factors are independent of your individual spending power, and are simply a comparison of perceived quality vs. financial outlay. It is a good experience to acquire the sample set, at least, and I would recommend (as always) that the curious Reader forms his own opinions - take these notes as merely a "second opinion". The "Longfeng" [dragon pheonix] is one of the more inexpensive 2007 Xizihao bing, whose name (in Chinese culture) brings to mind the union of opposites. At the wedding ceremony, dragon-and-phoenix symbology abound regarding man-and-wife. I wonder if this dualism is intentional for this cake, or whether they were picked simply because they sounded poetic. The jury is still out on this one. Tight compression. The leaves are apparently from Hekai Village, in Menghai County. The product page claims that it is made from 2-leaves-1-bud systems, and while quite a few can be discerned, it is mostly filler leaf. The aroma is sweet and dark, very strong, and exceedingly pleasant. What a perfume! A dark-gold soup. The tips impart a certain smoothness to the texture which is absent in the other cakes. 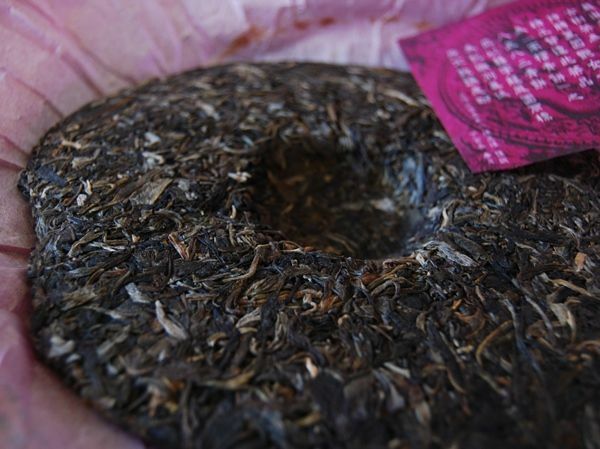 This cakes starts out muted and low, with a straight, honest pu'er flavour that I rather enjoy. Later infusions see the sweetness increase, to the point where it is tasting like a rustic honey. 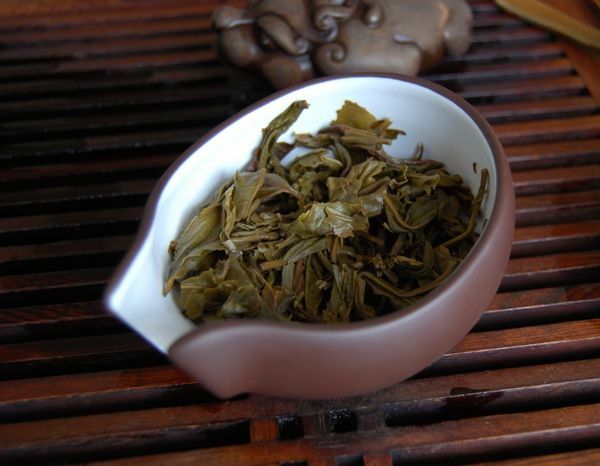 A touch of citrus lives about the edge, and the yunxiang [aroma after swallowing] is buttery, akin to gaoshan wulong. By the fifth infusion, the tea has turned a corner, and fades rapidly (though in a controlled fashion). Mulch, with some spring tips. A few dark leaves, must mostly a sea of bitty, green fragments. Not as much to my liking as the 8582, it is fairly decent. This is definitely Division Two tea, compared to the quality of leaves used in the expensive pair of cakes. Rough honey, tangy, quite enjoyable. It's one of those rustic, tobacco-esque numbers. I quite enjoyed the rolling huigan, too. This seems to be yet another cake that I have not tried since buying it. I recall being anxious about spending what was then £23 on a cake. These days, even the most basic would cost around that price. It is dark, now, and has a delightfully low and rich aroma. 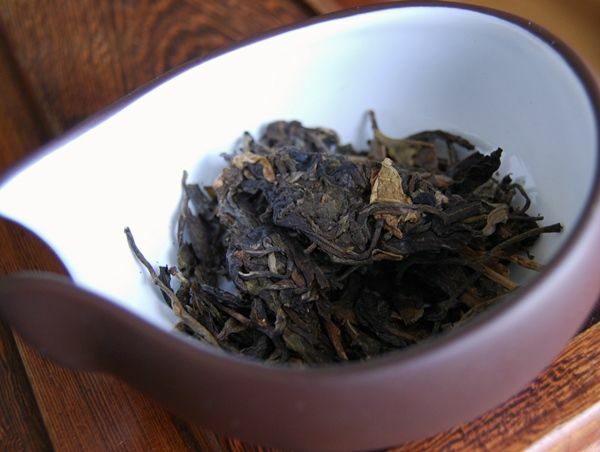 Zidu [purple belly], my teapot, gleams in anticipation. The scent really is rather delicious. The small, fragmented leaves appear most appealing. The dragon-and-phoenix motif usually signifies the coming together of two opposing principles - typically the masculine and feminine, hence its frequent use as a symbol of matrimony. In tea, it can refer to a blend of two very different, but hopefully complementary, regions. I suspect that the cake may have aged to the point at which identification of its components will be a difficult task. Strong, becoming orange, and woody-sweet as with many of my English-stored cakes, this bing is travelling in the right direction. I take the second cup to my dear wife, who is gardening, and who stops to enjoy it with a complimentary sound. The long sweetness folds into the kuwei [good bitterness] in the throat that keeps this tea interesting - and satisfying. It endures very well; I wrote previously that it could manage only five infusions, whereas it now steams past five while remaining solidly sweet. It is something of a success, for such a low price. Another five years has passed! I read the above article and weep figurative tears at remembering the days when £23 was considered by me to be a serious amount of money to spend on tea. Twenty three! £23 in 2007 is, adjusted for inflation, £28 in 2018. This article is not going to be smugly lauding prices of yesteryear over you, Gentle Reader. The pain of modern pricing is ubiquitous - it is felt by all. The sweetest irony is that when prices were low, I was a humble graduate student on the tightest of budgets. I'd been married a year, and was saving hard for a house - spending £23 on tea was an adventure! If only, if only, I'd been making the proverbial bank back then. But such is life! This cake is a fascination: it was bought back when it was created, and has since been stored in my home, here in little old Oxford. It is the product of Oxford storage! But is it any good? I was worried, as surely are we all, that the Western domestic circumstances in which the cake found itself for the past 11 years might cause cakes not to age well, or, at worst, to ruin them completely. It rarely gets hot in England (although, at the time of writing, we are in a heatwave that exceeds, oddly enough, the temperature of the Pacific island on which I've just spent some time). It is, however, really wet here. If you check out the "musings" page, you'll find a few entries under "English storage", the last of which appears to have been written five years ago. Now a half-decade later, the effects of English storage, and Oxford storage in particular, are becoming more clear. Teas age slowly here, but they seem to age well. At least, they are neither dying/sleeping, nor becoming sour, as far as I can tell. This must be the contribution of the humidity, for surely dryness is the enemy of pu'ercha. The long time-constants involved are, I speculate, due to the cooler temperatures that we experience, when compared with the tropical regions in which pu'ercha is more usually stored. This particular XZH, for example, is pretty good now! When it was new, it was "division two", as I noted above. These days, while its "non-premium" quality can be discerned, it is much more enjoyable than once it was. I perform an unbiased sample by asking my dear wife to try a cup, without telling her what she's drinking. This is a rather hard test, because she tends to be quite averse to raw tea. "This is good! There's nothing bad in it at all!" she observes. Indeed, there is nothing bad in it at all, I believe. The sweetness is very long indeed, testifying to the clean manner of the processing, while them there huigans are present in abundance. I enjoy the low, rounded character of a tea that has entered its middle age. I imagine that, were this cake to be stored in Guangzhou or Malaysia, it would be very much darker by now. However, I live where I do, and must live with the consequences - in pu'ercha, while not accelerating towards deep red characteristics, it has moved nicely away from its green youth. I am pleasantly relieved! With this post, the Half-Dipper happily marks its century. As the subject of tea-writing has become discussed of late, I wondered if perhaps it would be a good time to write a little about the Half-Dipper itself. iii. to make and strengthen tea-friendships, sharing our thoughts and tea-samples with one another, and generally have a fine time with like-minded souls. So, to you, Gentle Reader, I offer sincere thanks for your contributions in all of these areas. From the silent reader to the regular contributor, your visits to the page have helped transform it into something that I hope provides some benefit. One of my quiet pleasures is perusing the statistics about the Half-Dipper readership, and it is something that I would like to share with you, as it underlines just how widespread the tea community really is - this is a marvellous thought given that even 15 years ago, such an endeavour would have been almost entirely impossible on any similar scale. Can you see your home-town? Approximately 50% of the 100-odd daily visitors come from the Americas, 30% come from Europe, and 20% come from Asia. In fact, it's interesting to note that there are very few visitors from Mainland China itself (excepting a handful of daily readers in Kunming, Guangzhou, Shanghai, and Beijing) - this is quite the irony, given that most of what we discuss here is the produce of China! Perhaps it's the so-called "Great Firewall of China" at work. As some of you will know from private correspondence, I am not a fan of the conventional, autobiographical blog: I have many friends that write such sites describing the minutiae of their lives. The site exists with themselves as the subject and author. There is nothing inherently wrong with this style (even Pepys did it! ), but it isn't my cup of tea, nor a direction in which I wished to take the Half-Dipper - which exists only for the three goals mentioned above. However, in writing about tea, I've noticed that a certain element of humanism is required. In some of the great tea blogs that I enjoy (many of which are listed in "My Diurnal Digest" to the left), I have found that I like to read not just about the leaf itself, but about the context in which it appears. Like many, I enjoy the natural settings of Tea Logic, the Oriental explorations of MarshalN, the busy suburban surrounds of Phyll, the tea-fields and tea-ceremonies of Teamasters, and the cosmopolis of Chadao, to name just a few of the richly rewarding sites in that list. To that end, I have found a little of my own tea-drinking context naturally creeping into the Half-Dipper, while still keeping the tea the subject. This seems like a healthy balance, and reflects what I enjoy in the works of others. 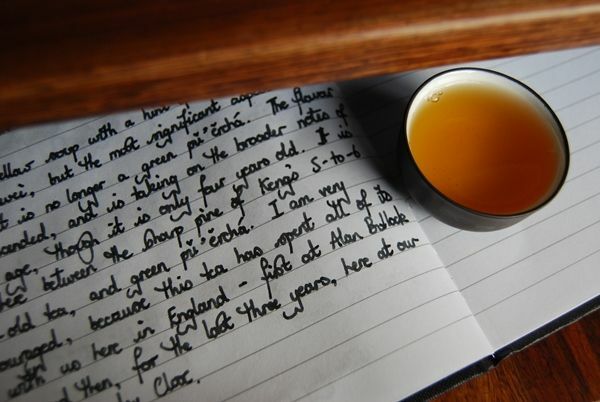 As a brief examination of the Half-Dippers Index of Tasting Notes will show, we drink all types of tea. This is not, nor never will be, a "pu'er blog", simply because Lei and I find enjoyment in every corner of the tea map. ...which, more or less, follows Lei's and my own particular preferences. 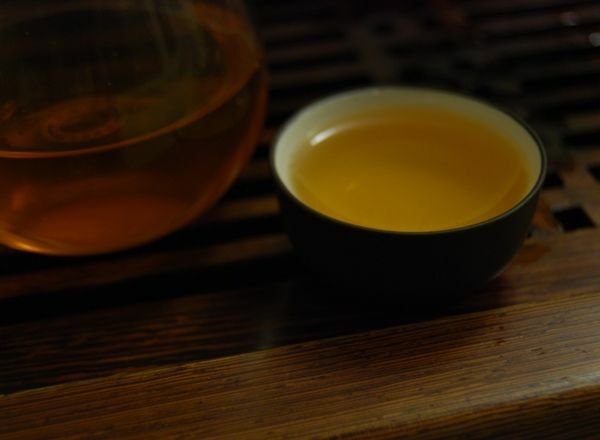 Looking at the Index of Tasting Notes, it is a happy coincidence that the teas considered fall into approximately similar proportions: pu'er the most frequently-encountered, then wulong, hongcha, lucha, and other teas. Hopefully, this means that, by sheer coincidence, the teas we explore in the Half-Dipper align fairly well with expectations. With all that said, I would like to emphasise the sincere gratitude which we have to you, Patient Reader, in helping Half-Dipper along its rambling course. Without further ado, let's delve into the 2007 Baxian Dancong. Selling at $24/100g from Jing Teashop, this is a fairly low-priced tea, given its providence, listed as being true single-bush (of course the goal of dancong, though many are blends from multiple bushes, often not in the same region). Ian notes a balance of orchid and lychee. Notes on the Baxian [8 immortals] genre can be found in a previous post. Huge and beautiful, being 6-7cm of twisted leaf. Some are very dark, some remain very green, making an attractive contrast of the two types. This greener aspect is, to my understanding, typical of Baxian. The radiant yellow-green soup reminds me that this is gaoshan wulong, and it has impeccable clarity. The aroma is truly lovely, being both floral orchid and sweet/sour lychee, just as Ian observed. 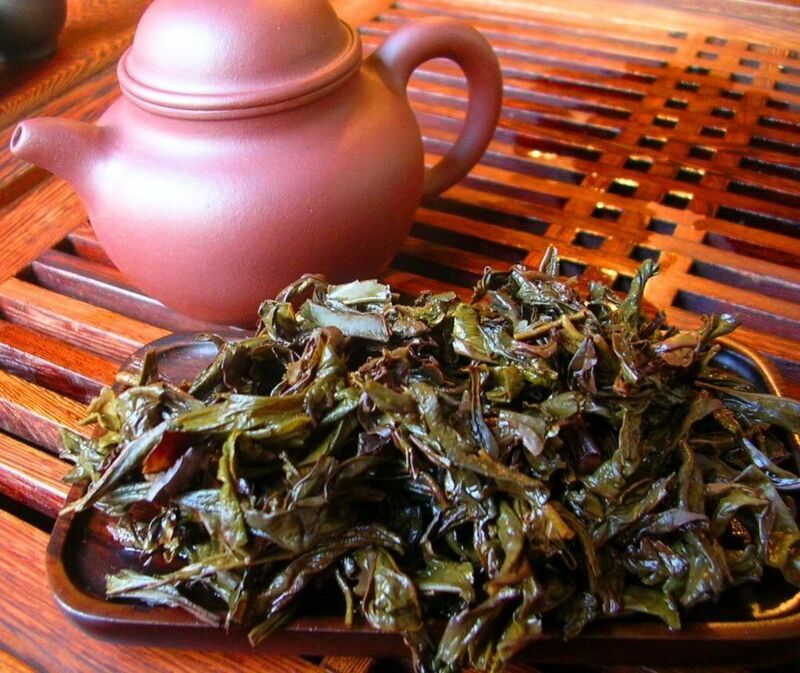 The long, buttery-sweet lengxiang is further evidence that this is based on a fine gaoshan wulong leaf. The tea is vivid, with a fine chaqi rising up the throat and back. In comparison with the second-grade Baxian from Royal Tea Garden, it is Heaven-and-Earth. There exists a wonderful sourness in the finish that results in a good huigan. 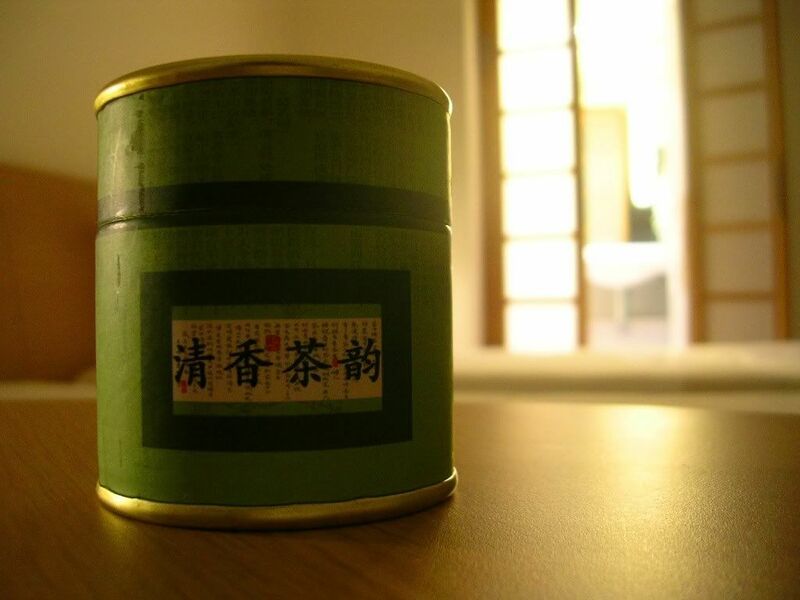 As in the lengxiang, the buttery yunxiang [aroma after the swallow] is pure gaoshan excellence. Even after six infusions, the tea, while simplified, remains very fine. Wet leaf: Unusually healthy, these leaves are robust, quite thick, and verdant. The edges are brightly oxidised. The basis leaf is of an excellent grade, as evinced when they are turned out of the pot for inspection and in the very good endurance shown during its evolution from infusion to infusion. On top of this, the oxidation and light roast have been expertly wed so as to work in symphony with the buttery gaoshan characteristics, whereas they are so often imbalanced due to more coarse processing. Couple these facts with the fairly low price (in comparison to those of other dancong vendors) and this tea is an absolute winner. It is, without any reserve, the finest dancong I have encountered. Profuse thanks to Ian for the generous gift, and the excellent choice. With the expensive pair of Yuanshilin and Huangshanlin already examined, we move into the Xizihao 8582. No daft poetic names here, just a recipe code, indicating its origins in 1985 Menghai Factory (notionally using "grade 8" leaves). As the Yunnan Sourcing web-page for this bing notes, this cake promises to "take the drinker back in time 20 years". I must confess that I like the product pages at this vendor's web-site as they are usually very informative, combining detailed accounts of leaf providence and picking seasons with background on the factory of production. Plus, I enjoy counting how many exclamation marks the author can use within the space of a single paragraph. I wonder if claiming that this cake will take me back to 1985 is a bit like claiming that eating a sandwich will take me back to the 1760s (when the Earl of Sandwich decided that putting meat between two slices of bread was rather tasty)! Sales pitch aside, what's this cake like? CB has previously made the bold assertion in these pages that she has decided to acquire a tong of the 8582 - so let's find out if she's mad or not (in the nicest possible way). Good and dark, yet broken - in contrast to the chunkier leaves of its more expensive cousins, and in keeping with the 8582. That ever-cautious part of my mind causes me to wonder if these leaves were the rejects from the two more expensive cakes. The compression, also, is much higher than the others. Do not be diverted by the short number of infusions - this tea received the unusual dignity/ignominy of being taken to my office, where it was later brewed informally throughout the day while I went about my duties. It lasts much longer than this list of four infusions would otherwise suggest. Magdalen tower rings in six o'clock. The soup is thick and yellow, and it has a fresh, green nose that fades rapidly. This tea is thinner than its more expensive counterparts, and is more "impatient" (vanishing from the mouth more quickly), but is more balanced overall - it isn't oddly processed (like the Shanshilin) and it isn't missing bass notes (like the Huangshanlin). There is some ku in the finish, giving it a mini-huigan, and it ends rather dryly - a little like the mouth-watering sour-sweetness imparted from the must of grapes. The feeling is robust, with chunky mushroom flavours that appeal, while being a little tangy. The flavour is broad and decent for a 2007 cake, and I like it. Mostly chopped, mixed with some young 3cm leaves, suggestive of a spring picking (well, it could hardly be a guhua [autumnal grain-flower] picking, given that it's still summer). Decent. While being a clear step down in potency from its expensive cousins, it offers robust flavour, good ku, and fair smoothness. CB's sanity is clearly intact (as if there were any doubt), and I suspect that I shall acquire some of these for our tea cupboard, too. We have recently been discussing the merits of the 8582, which reminded me of this Xizihao version. 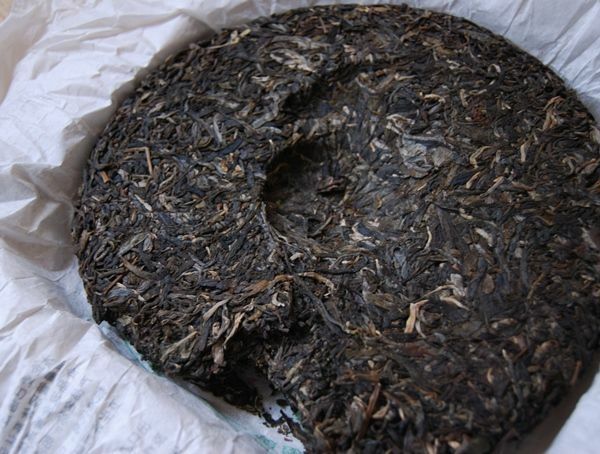 It is rather an important cake for me, because 100% of its life has been spent with us here in England - we bought five from Yunnan Sourcing for the very reasonable sum of £21 immediately upon its release in 2007, now four years ago. It is a pretty cake, and I am struck by just how good the leaves are for what is, nominally, an 8582 clone. Whereas one would expect chopped, fragmented leaves, this Xizihao version is comprised of large, flat leaves; fragmented, yes, but otherwise looking very appealing. The aroma is low and sweet; it has settled into something heavy and dark, from the green spiciness of its youth. I am impressed, and relieved. It starts out somewhere younger than the pine-like sharpness of a whole cohort of five- and six-year-old cakes that Keng generously provided, and yet it is still darker and richer than a green, raw shengpu. It has a solid kuwei [good bitterness], and yet has deepened noticeably in character. This time around, I appreciate a thickness of body and a cool, active sensation on the tongue that I had not previously observed. Progress like this gives me hope that we're doing the right thing, after all, with our storage. English storage of pu'ercha? Whatever next? It's a strange new world.